More and more employers are offering their employees the option of directing their health care spending with Flexible Spending Account Plans (FSA), through “Cafeteria” Benefit Plans. 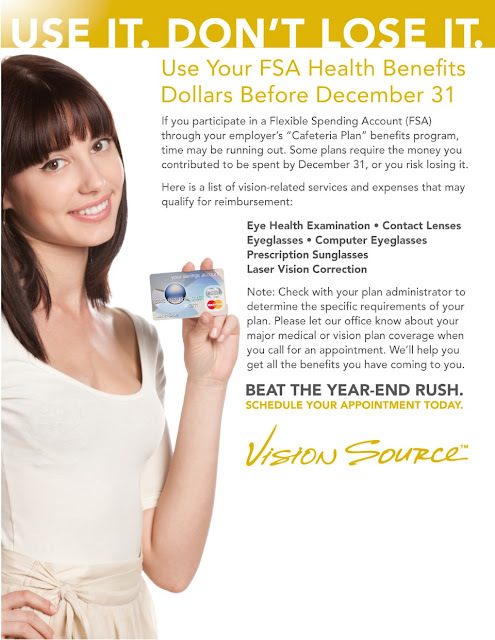 And savvy plan participants are directing that spending towards eye care. Most participants know they can use their plan dollars for eye examinations, eyeglasses and contact lenses. But there are many more ways to apply those dollars towards eye care. For example, plan participants can use their accounts to pay for prescription medications for eye conditions such as dry eye syndrome and glaucoma, even laser vision surgery. These plans may also be used to extend the benefits of a patient’s vision plan. A patient who is covered by a separate vision plan, can use flex dollars for the co-payment on a covered eye health examination. Or, if their vision plan provides one pair of eyeglasses, the patient can use plan dollars to pay for computer glasses, driving glasses or prescription sunglasses. Some plans have a deadline by which the employee must use the dollars in their account or forfeit them. Contact lens patients who face such a deadline may consider purchasing an annual supply of lenses with their remaining plan dollars.